Roland Kannor, Managing Director of Brentwood Brewing Company said: “The small brewing industry is very tough at the moment with 29 pubs a week shutting, four new breweries a week opening and a 20% increase in the price of barley for 2019. Billericay Brewing will make use of the extra production capacity that Brentwood Brewery has to offer. Brentwood’s bigger brewhouse facilities, next door to Calcott Hall Farm Shop off Ongar Road in Pilgrims Hatch, mean that Billericay can brew four times more beer per batch than before. To celebrate this new arrangement, the two local breweries are planning a collaboration brew which should be ready for drinking in March. The new IPA 5% ABV beer is yet to be named, so the breweries have launched a competition inviting suggestions. There is an 18 pint Polypin of the new brew for the winner. The new collaboration beer is due to be officially launched at Billericay Brewery’s Spring Beer Festival which runs from 21st – 24th March. Brentwood Brewing Company began trading in 2006. 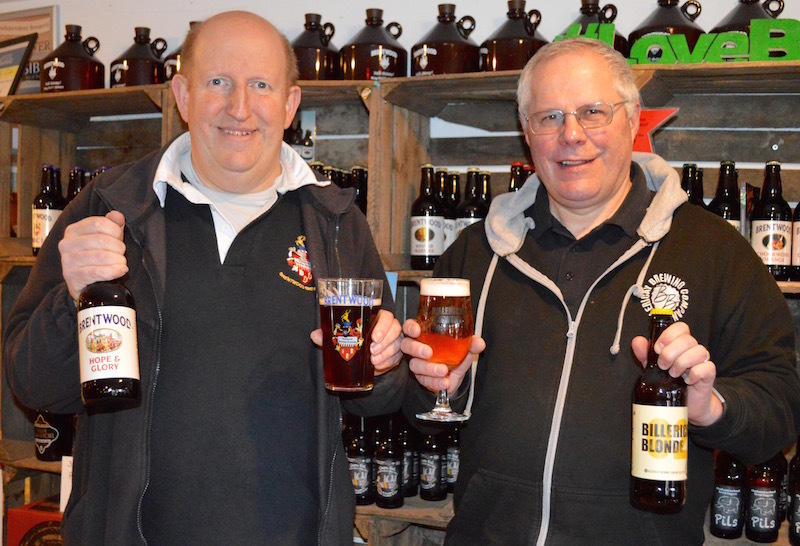 Billericay Brewing Company started in 2012. Both companies are run by people with a passion for making and drinking the finest craft beer. “We’re all looking forward to finding lots of other ways that we can work together in the future,” added Trevor. 12 June 2018 – We are proud to launch the next part of our membership scheme the Beer Club. This is your way of getting a regular supply of our bottled beers to drink at home. 6 bottles per month for £15 per month. 12 Bottles per month for £25 per month. This will be a different selection of beers each month, mainly showcasing our beers but also included selected guest ales too. It will always include any seasonal special bottles for that month. The prices above are for collection from the shop but we also offer local delivery for an extra £5 per month (postcodes CM2, CM11, CM12, CM13, SS11, SS12, SS13, SS14, SS15, SS16). At the moment you can only join at the shop and then you pick up your first box on the day at the reduced rate of £10 for 6 and £18 for 12. There is no long term commitment, you can leave the Beer Club at any time by notifying us. If you do want to make a commitment then you can sign up for 12 months and only pay for 10 months – £150 for 6 bottles and £250 for 12 bottles (plus an extra £50 if you go for the local delivery option). We emphasize that the benefits of the membership scheme will continue and you do not have to join the Beer Club to receive these benefits. If non members join the Beer Club then they join the membership scheme too. As an existing member if you join the Beer Club you will receive a free pint on the day! – our way of thanking you for being one of our first members. 30 Nov 2017 – Membership & Loyalty Scheme launched! Sign up and received regular newletters, discounts on beer and cider and entry into competitions. Further benefits to follow: Member events, competitions, loyalty gifts, subscriptions service. Full terms and conditions on our Membership Terms & Conditions page.